If you’re a regular reader, you’re probably wondering how I ventured back to a Turkish post. Well, I’ve decided to join a monthly travel guide link up organized by Fiona, a fellow travel blogger, based in Brisbane, Australia, Tiffin Bite Sized FoodAdventures. Each month features a new letter of the alphabet. This month is the letter “I.” I know I’m joining in a bit late so I won’t cover letters A-H, but I thought this link up would push me to publish a few more of my thousands of travel photos. The trick is to only chose ONE photo per post. It would be easy to write about Istanbul as I’ve done so often on the blog. However, I thought I’d feature a different Turkish city – Izmir, the country’s third largest city. During the three years we lived in Turkey, I visited this Aegean coastal city on three separate occasions. My Izmir trips coincided with visits to Çeşme, Kuşadası and then lastly the Greek island of nearby Samos. As I looked back through my photos, I realize we hardly gave Izmir a chance. I should have spent more time wandering the city’s cobblestone streets or along the seafront. At least, we spent some time in one of the city’s main highlights – the Konak Square (Konak Meydanı). This busy square is located at the southern end of Atatürk Avenue and is named after the Governor’s Mansion or Vali Konağı. The singular word konak means mansion in Turkish. In the middle of this square is the ornate Izmir Saat Kulesi, a historic clock tower designed by a Levantine French architect and built in 1901 to commemorate the 25th anniversary of Sultan SultanAbdülhamid II's accession to the throne. Interestingly, the clock was a gift from German Emperor Wilhem II who also has a fountain in Sultanahmet’s Square named after him. Izmir itself is a lovely city and definitely deserves its own time for a longer visit. 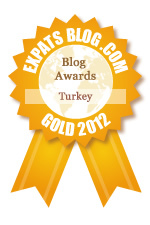 Pop on over to my blogger friends at Turkey’s for Life to read about their numerous tips for visiting Izmir. Join me in March for the letter "J"! oh that is fabulous! what a sky, what a tower (minaret?) Terrific photo. I love reading about places I've never been. Gives me a new idea for future trips. Thanks for sharing! Thanks Sherry! Although it does look like a minaret, it's actually a clock tower.